One of the more tiresome things about Twitter is the way that a photo goes viral, without the photoer who photoed the photo getting any credit for the photo. … in Chicago, on September 3rd, the photoer was eventually identified. Commenter Chris Gallevo, to whom thanks and respect, steered any who cared, which included me, to the Instagram site of Kevin Banna, where the above photo is to be found. I was not able to discover what Kevin Banna himself looks like. That’s the trouble with image googling the name of a photoer. Are the results photos of him, or merely photos by him? It’s not easy to know, without more labour than I was prepared to give to the question. In a backhanded compliment to Banna’s photo, and also to the extreme drama that the weather in Chicago is apparently capable of providing from time to time, some commenters accused “someone” of having Photoshopped this image. 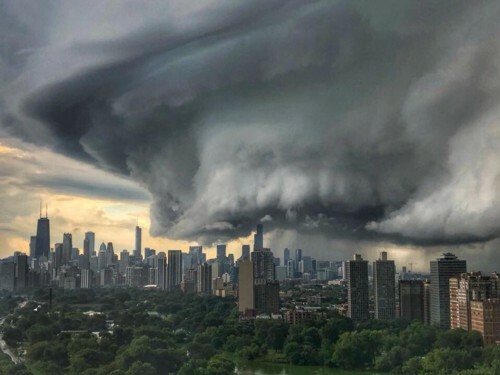 Other commenters assured us that the weather in Chicago that day really was very dramatic, in just the way the above photo portrays, and that it general it regularly lays on such displays and dramas.